In a new report, analysts at MKM Partners took a close look at some price charts in the stock market and updated their technical outlook for several big names. Here’s a summary of their findings. 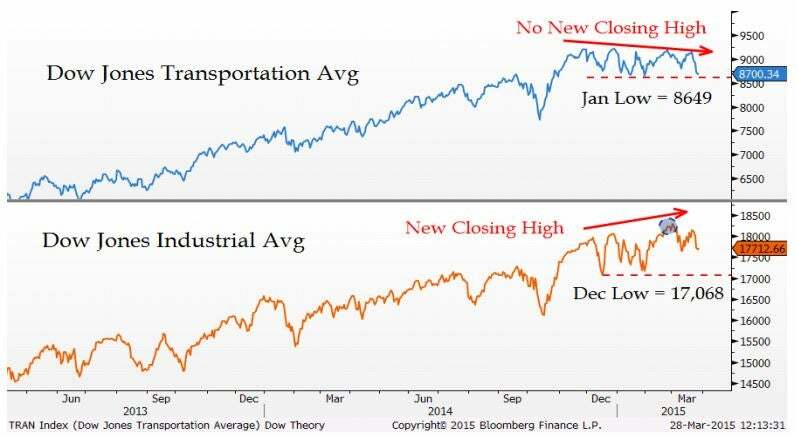 According to the principles of Dow Theory, traders should be watching transportation stocks closely. While the Dow Jones Industrial Average is making higher highs, the Dow Jones Transportation Average has been making lower highs. All though no “sell” signal has been triggered until both indexes start making lower lows, MKM recommends that worried traders should start by selling rail stocks, as they see the following names as “weak links” in the transportation sector: Con-Way Inc CNW 0.96%, Canadian Pacific Railway Limited CP 0.17%, Landstar System Inc LSTR 0.15%and Norfolk Southern Corp NSC 0.37%. While analysts are watching closely to see if airline stocks will follow the rails down, so far the divergence between the two transport subsectors has held. Traders should watch closely for signs of regression in the airlines or signs of an overall weakening of the transportation sector. However, barring either of those two occurrences, MKM analysts recommend buying the following airline names: Alaska Air Group Inc ALK 0.93%, JetBlue Airways Corp JBLU 0.41%, Southwest Airlines Co LUV 0.77%and United Continental Holdings Inc UAL 0.65%. Analysts see plenty of strong charts in the consumer staples space. In the report, MKM highlights the following stocks as buys: Flowers Foods Inc FLO 1.52%, McCormick & Co Inc MKC 0.89% Rite Aid Corp RAD 2.22% and The J.M. Smucker Co SJM 0.97%. 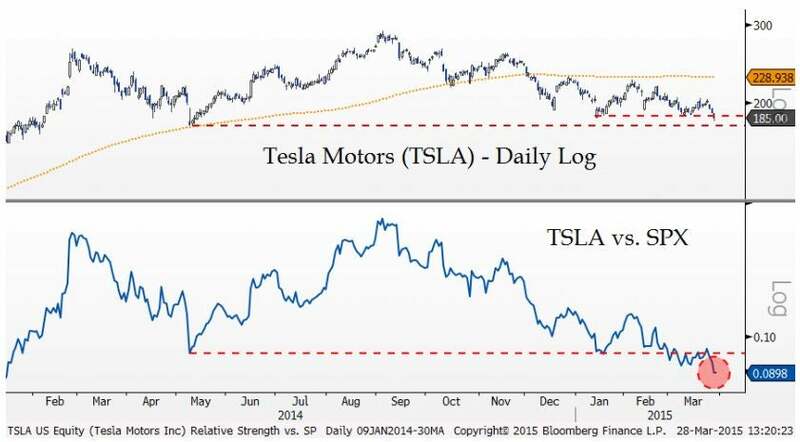 The report mentions several other big name stocks, including a warning that traders should sell Tesla Motors Inc TSLA 3.01% into any rallies due to the technical weakness in the stock’s chart. In addition, MKM recommends selling United Parcel Service Inc UPS 0.7% and buying Matson Inc MATX 1.58%. March 30, 2015 in Market News.